Our eyes are known as the "windows to the soul" - and since they are receiving so much undivided attention, they are also one of the first places to give away our age. Roll away your eye problems with a daily dose of our amazing roller. We can address all of these issues with our Powerful yet Gentle unique blend of natural and technologically advanced ingredients! Treat the following eye conditions with Eyelift Xpress by Platinum Skin Care. The skin around our eyes is literally 10x thinner than the skin on the rest of your face, so we must be extra gentle when dealing with the fragile skin in the eye area, and choose only products that are created for this sensitive region. We know not everyone loves to read, read, read all the information on a web page. So take a few minutes and just listen to Platinum CEO as she explains why this product is so helpful for your troublesome bags, dark circles and lines! Collagen is responsible for upholding the skin's integrity. Daily sun exposure, pollutants, blinking and smiling all accelerate collagen degradation - which accelerates the aging process - revealed on our faces as crows feet and wrinkles! Puffy eyes are usually caused by either eyelid oedema (water accumulation), from poor lymphatic circulation, or from weakened capillaries that leak and cause the pooling of blood under the eyes. Dark circles can be caused by allergies, leaky blood vessels, and excessive melanin pigmentation. What Causes Puffy Eyes and Dark Circles In The First Place? If you are dealing with eye puffiness, that means you have too much accumulation of fluid, called oedema, in the surrounding eye tissues. Because the skin around the eyes is the thinnest skin in the body, swelling and discolorations can be rather noticeable. Allergies *Try Claritin for 30 days and see if the problem resolves itself. Aging *Fatty tissue can push forward. This needs corrective surgery. Systemic diseases such as kidney failure. Some families seem to have more prominent swelling around the eyes. This is a feature that cannot be changed. *Possibly improved upon though. What Can I Do To Reduce My Puffy Eyes? A cool compress is helpful for morning puffiness. Sleep on your back. Side and stomach sleeping cause pooling of liquids. Drink enough fluids to get your circulation pumping. Reduce your salt intake *not just sprinkling salt on foods - most processed foods are laden with salt. Drinks as well. Get enough sleep each evening, but don't sleep 12 hours. Excessive time sleeping can cause fluids to pool. A blepharoplasty procedure can help to tighten the eye area and reduce upper eye puffiness. Apply a daily product with ingredients created to help drain the liquids such as Platinum Eye Restoration Therapy and Eyelift Xpress Caffeine Roller. Get both in a discounted Kit HERE. Many dark circles are genetically caused. They are very common in the darker skin types such as black skin, Indian skin and Asian skin. Allergies are a bit stimulant for dark circles as well. *Even if you are not observing symptoms (scratchy throat, watering eyes, red eyes, runny nose) you can still be effected. Try an OTC such as claritin. First off, what color are your circles? Are they blue or brown? Bluish color: Your dealing with blood vessels. They are swelling to hold more blood. This is most common with aging skin. As the skin thins the veins will show through more easily. Plump the area with Hyaluronic Acid to keep the skin further away from the vessels. Brownish color: You are most likely dealing with pigmentation. Fade Bright 2x per day along with an eye cream or eye roller created to lighten dark skin. The draining effect of EYESERYL® SOLUTION B achieves a reduction of puffy eyebags in only 15 days - fast anti-eyebag action. In Vivo testing of 20 female volunteers aged 18 to 65 applied a cream containing 0.01% of EYESERYL® SOLUTION was applied 2x daily during 60 days. Several parameters were measured instrumentally, visually and physically evaluated by a dermatologist. View the dramatic improvement within the first 15 days alone in the following pictures. Conclusions. These tests were done at a very low concentration in order to define a minimum concentration for which an effect is measured. Puffiness under the eyes is greatly reduced, even after only 15 days: 70% of the volunteers had improved at Day 15. At the end of the test 95% of the volunteers had improved. Elasticity, as measured with a Cutometer, had a 30% increase after 30 days. Moisturization, as measured with a corneometer, is significantly increased after 60 days. REVITAL EYES(R) is a unique blend of probiotics, green tea, pomegranate carbohydrates and caffeine. Its main functions are to: inhibit melanin production, reduce hyperpigmented areas, even skin tone, reduce appearance of dark circles, stabilize collagen and elastin, protect from environmental stressors, improve capillary strength and reduce pooling of blood, provide immediate skin tightening and lifting, optimize hydration levels, reduce fine lines and wrinkles, constrict blood vessels, deflate puffiness, increase circulation! Results on Subject #1. Pictures demonstrate a noticeable reduction in bags and dark circles under the eye after 3 weeks. Results on Subject #2. 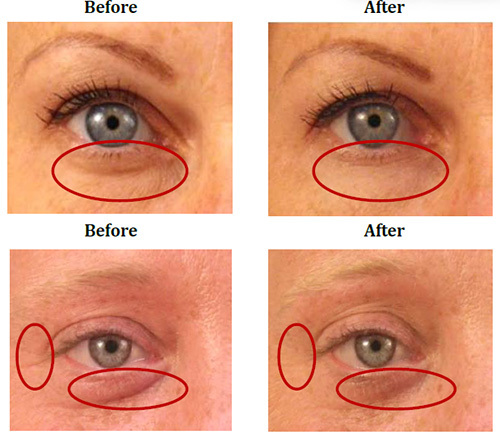 Pictures exhibit how crow's feet, wrinkles, dark circles and bags around the eye have all diminished after 3 - weeks. All eyes appeared more youthful at the end of the three week study. The physical tightening effect is intense, immediately noticeable and last for several hours. Various types of wrinkles are visibly and measurably minimized. Liftonin®-Xpress smoothes the area around the eyes by up to 74% within one hour! Liftonin(R)-Xpress smooths large and small wrinkles. The wrinkle smoothing effect can be seen in the images with the naked eye! Liftonin(R)-Xpress smooths eye wrinkles. Qualitative presentation of the wrinkle reduction in the area of the eyes before and 1 hour after a single application of a gel with 3% Liftonin(R)-Xpress. 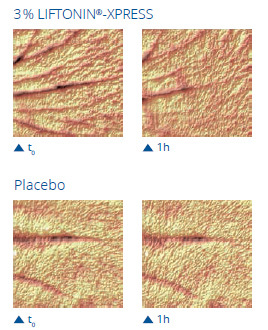 **All pictures, graphs and studies courtesy of Lipotec(R), Active Concepts, and Rahn Group. Gently roll under the eye from the inner corner to the outer corner, up onto crows feet and over the eyelid. Apply one or two times. Smooth in any excess with fingertips. Follow with Platinum Eyes Restoration Therapy for best results.